Frankly, I’m shocked — shocked! — at the idea of someone making money this way. I mean shouldn’t all ideas be free to everyone? Why not just share the design with the world? Isn’t that what OLPC was all about? Has anyone told Richard Stallman about this? Ahem. At the very least shouldn’t OLPC be the one making money on this stuff? They could license this super valuable technology to commercial companies and use the money to buy laptops for poor kiddies in the developing world. 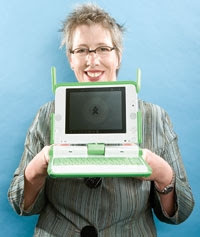 Another question worth asking is whether Mary Lou Jepsen actually managed to retain ownership of her designs while working for OLPC, a 501(c)(3) organization. If so, doesn’t this mean that in effect taxpayers subsidized the R&D for whatever “for-profit company” Mary Lou Jepsen is now about to launch? Well, much love, taxpayers — and a big namaste to all the corporate sponsors and the good folks who paid $400 for the Give 1 Get 1 program. Not to mention those poverty-stricken nations who’ve placed orders. Thanks for the seed money, kids! How’s it feel to be venture capitalists?